5 out of 5 based on 216 ratings. Cleaning tough stains and tackling foul odors in the home just got easier! Try out the AquaMate Shampoo the next time you have a stubborn spot on the carpet or the Rexafoamer Shampoo if you have a stain on your furniture and watch how quickly it comes up! If lingering odors are a problem, try the Fresh Air Concentrate and start enjoying the fresh air again in your home! With the Rainbow being the pioneer in the industry of water filtration vacuums, they also are a leader in the quality of supplies as well. This shampoo is made exclusively for use with the AquaMate shampooing system which cleans and deodorizes your carpets. This 2 ounce bottle of AquaMate shampoo is a perfect solution for spot cleaning or for use with your MiniJet system. Fresh Air Concentrate, 2 oz. 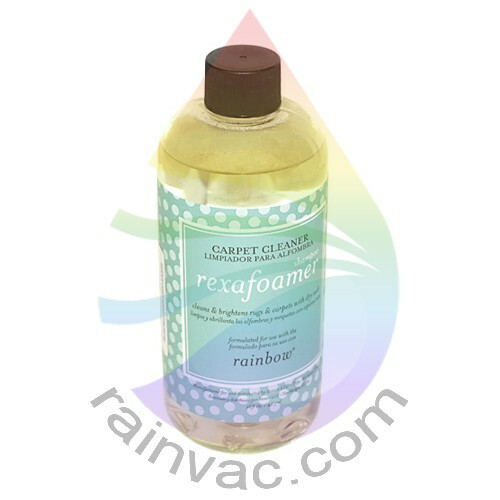 The fresh air concentrate works with your Rainbow Vacuum or RainMate to deodorize and freshen the air in your home. Now available in a 2 ounce size. Clean Floor Concentrate, 2 oz. This cleaning solution is perfect for your RainJet and squeegee accessories to clean your floors efficiently without mess. Now in a 2 ounce trial size. This shampoo works specifically with your Rexafoamer tool to remove dirt and grime easily and completely from your upholstery, carpets, and rugs. Kill germs and make your home spring fresh with this deodorizing agent to use in conjunction with any Rainbow Vacuum system.